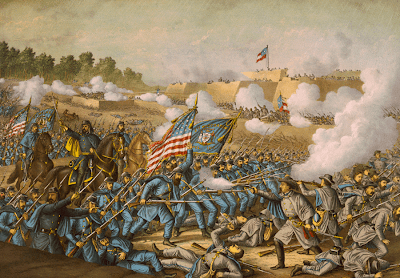 The border is red, rather than the black border of the official issue. The background of the wildlife scene with three ducks is light blue rather than the silver-gray of the official issue. Otherwise the design is virtually identical which suggests that the patch was made from the original embroidery pattern. Given the scarcity of this variety it is probable that this patch was perhaps a manufacturer's sample rather than a full loom run. You can view full sized versions of both the official and the newly discovered red border variety on the Wahunsenakah Emblems-Other page on kecoughtan.com here. 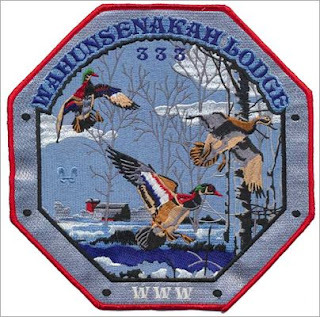 Thanks to Larry Johnson for the picture and information about the red-bordered 333 ZJ-1 jacket patch. 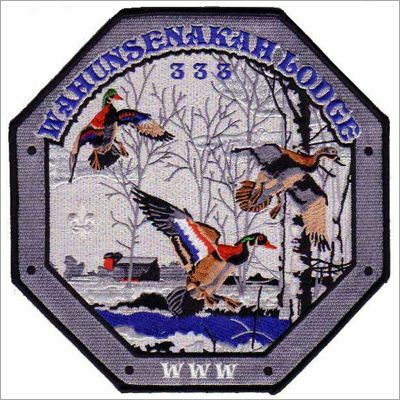 The Brothers of Wahunsenakah Lodge 333 gathered for their annual Holiday Banquet on December 1. Hosted by Pamunkey Chapter, the banquet was held at the First Presbyterian Church in Hampton. Guest speaker for the event was Eagle Scout and Brotherhood Member, Mr. Parrish Crosby; Virginia Air and Space Museum Scout Liaison. 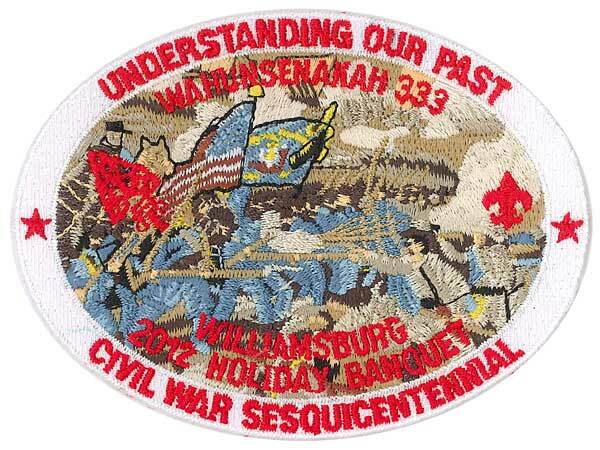 In keeping with the prior 2012 activity patch theme of recognizing the Sesquicentennial of the Civil War, the Holiday Banquet patch issued for the occasion features a scene from the Battle of Williamsburg, inspired by the 1893 illustration of the event by Kurz and Allison entitled Battle of Williamsburg-Gen. Hancock's charge, May 5, 1862 (pictured below). The activity patches for Wahunsenakah Lodge this year have been outstanding examples of utilizing local features to highlight the unique culture and history of the region served by the Council and Lodge. The Lodge Insignia Committee deserves recognition for taking the time and effort to insure that the event patches served as far more than generic or standard themed emblems, but instead paid tribute to a significant part of our nation's past while highlighting the local areas involved. I am sorry to see the year end and the series completed. It will be a hard act to follow!